Note: DVD již neobsahuje dárek v podobě fotografií. Breaking Dawn Part 1 opens over the Black home on the Quileute reservation. Jacob (Taylor Lautner) storms out of the house, dropping a formal invitation to the ground. Jacob's father, Billy (Gil Birmingham) wheels out after him, but Jacob phases into wolf form and races out into the pouring rain and the woods. Billy picks up the invitation: it's to Bella (Kristen Stewart) and Edward's (Robert Pattinson) wedding. Both Bella's parents receive wedding invitations. It's clear that Charlie (Billy Burke) is not thrilled with the engagement and is probably still upset with Edward for breaking Bella's heart. Renee (Sarah Clarke), on the other hand, is excited and has obviously been expecting the engagement as she shares the invitation with her husband, Phil (Ty Olsson). It's the day before the wedding and the Cullens are preparing their estate for the wedding, all under the direction of Alice (Ashley Greene), who has placed herself in charge, down to the last detail. She sends Bella home for 'lots of beauty sleep,' but Bella sleeps poorly; first, just before she goes to bed, Edward goes to see her and tell her of a time shortly after he was turned, when he struck out on his own to hunt humans for blood (even though his conscience ensured he only killed men who murdered and victimized other people), as a warning against Bella becoming a vampire; and then Bella has a nightmare where the Volturi-- Aro (Michael Sheen), Marcus (Christopher Heyerdahl) and Caius (Jamie Campbell Bower)-- are standing before them in place of the minister, and then suddenly both Edward's tuxedo and Bella's dress are covered in blood as they stand before a pile of bodies -- all of the wedding guests. Bella must face Alice on the wedding day after not having slept, but Alice is pleased to see Rosalie (Nikki Reed) finally starting to warm to Bella as the finality of Bella's joining the Cullen family is finally upon them all. Bella's parents give her a sapphire-encrusted hair comb to wear in her hair, much to Alice's delight. Bella starts to have anxiety as Charlie starts to walk her down the aisle, but seeing Edward at the altar chases them away. Wedding vows are spoken and the new Mr. and Mrs. Cullen share a passionate kiss as all of the guests applaud. Among the wedding guests are Billy, Sue Clearwater (Alex Rice), and her son Seth (BooBoo Stewart) from the Quileute tribe, and Bella's old schoolmate quartet of Mike (Michael Welch), Jessica (Anna Kendrick), Angela (Christian Serratos) and Eric (Justin Chon). The reception is a little bumpier than Edward and Bella would have hoped-- while introducing Bella to the Denali clan, a small cousin-coven of 'vegetarian vampires' from Alaska, one of them, Irina (Maggie Grace) happens to see Seth and recognizes him as a wolf, and promptly becomes very upset-- Irina was in love with Laurent and is unwilling to believe that he tried to kill Bella, insisting that like all of them, he wanted to live in peace with humans, and with her. Jacob finally shows up much to Bella's delight, but when Jacob says he needed to see her one last time while she was still human, Bella carelessly mentions she will be staying human during her honeymoon. Knowing that Bella means she plans to consummate her marriage with Edward while still human, Jacob becomes furious, because he is sure Edward would kill Bella in the process. The rest of the Quileute pack must come out of the woods to pull Jacob away; Sam (Chaske Spencer) curtly telling Jacob that Bella is no longer their concern. For the honeymoon, Edward takes Bella to a small, private island off the coast of Brazil that Carlisle bought for Esme. Two native Ticuna, Kaure (Carolina Virguez) and her husband Gustavo (Sebastio Lemos) are caretakers of the small villa house on the island. Bella's pleasure and enjoyment from the honeymoon, including finally making love with Edward, are cut short when Edward fusses over how he inadvertently left a number of bruises about Bella's body. Frightened of touching her again, he spends most of their time playing chess with her. Bella dreams of finally winning a game against him and starting to kiss him. When she wakes she is in tears, and she begs Edward to try making love to her again. At LaPush beach on the Quileute lands, Jacob is sarcastic in his thoughts on how Bella's death would be announced to the public. Jacob tries to take some comfort in getting to kill Edward once the treaty was broken, but Sam (Chaske Spencer) reminds Jacob that he is still alpha wolf of the pack and decides when and if the treaty is broken. Sam is satisfied that the Cullens are not a threat to the tribe or the human populace. Leah (Julia Jones) thinks Jacob needs to get over Bella, as he hasn't imprinted on her. The mention of imprinting brings back Jacob's cynicism; looking at other pack mates and those they've imprinted on, he is sickened at the thought of no longer belonging to himself while his genes tell him he's happy about it. But Leah feels differently; imprinting would at least rid a pack member of a very real heartache. As Edward is seeing to the private plane's preparation for takeoff, Bella calls Rosalie, the one person she knows will be entirely on her side, for help in preventing the rest of the Cullens from terminating her pregnancy. Jacob arrives home and finds Charlie's police cruiser there. Inside the house, Charlie tells Jacob that Bella called, and that her voice sounded off. Jacob is sure that Bella is very ill and goes to the Cullen home for an explanation. Bella hears Jacob's voice and calls to him, showing that she's there. Jacob goes upstairs to find Rosalie standing in front of Bella like a protective mother bear. Bella's unborn child has grown alarmingly fast and she already looks well into her pregnancy-- and the rest of her body is beginning to look more emaciated; her cheeks and face sunken and sallow. Carlisle says the embryonic sac is too strong to be punctured by a probe needle and an ultrasound cannot see inside it. Alice can't see any visions of the baby, or Bella, either. The Cullens are researching legends of rumored vampire-human offspring but have nothing concrete, and they are divided-- Rosalie fiercely protecting Bella's desire to have her baby despite several of the other Cullens unsure whether the offspring can even be called a baby at all. Edward takes Jacob aside and confides in him that he is worried about Bella's life, asking Jacob if he can try and talk Bella out of carrying her baby full term. Edward says that if Bella refuses to relent, and the baby kills her as most of the Cullens fear, he gives Jacob permission to kill him. When Bella does not bend under Jacob's attempt at persuasion, he leaves the Cullen estate in a rage and races through the woods in wolf form. The rest of the pack converges with him at a lumber yard, all likewise in wolf form, and they all argue. All of the pack is furious at the news of Bella's pregnancy, convinced that the unborn offspring will be unable to control its thirst and will be a dangerous abomination that will endanger the pack and the town. Sam decrees that the unborn offspring must be destroyed before it is born, even if it means they must kill Bella, and fight through the whole Cullen clan to get at her. When Jacob rebels at the decree, Sam advances toward him, using his authority as alpha wolf to order Jacob to fight alongside them. All of the pack, who must obey Sam's direct orders, are forced to bow their heads in submission. But suddenly Jacob, struggling with all of his will, thrusts his lupine head back up and invokes his right as the grandson of Ephraim Black, last chief of the tribe, to refuse to follow Sam any further. Jacob races back to the Cullen home and warns Edward to 'get ready.' Jacob finds that Seth has followed him-- he's left the pack and chosen to follow Jacob. Leah has likewise left in order to watch over her little brother. Jacob insists he doesn't want them to follow him, but he refuses to give them a direct order as alpha wolf to make them go back. Leah says Sam doesn't know she and Seth left the pack, but no sooner does she finish saying so when they hear the howls of the pack, telling them that Sam does know now. Jacob tells the Cullens what he's learned from Leah: Sam knows he's lost the element of surprise, and with the pack down three members, he is now outnumbered. The Quileutes will therefore keep the home surrounded and wait for opportunities to pick off the Cullens when chance permits. However, the Cullens are all in need of hunting (their eyes have become black, showing their thirst). Jacob is on watch near the river when Leah joins him. Jacob doesn't trust Leah near the Cullens because she hates them. Leah promises to do whatever Jacob wants, except go back to Sam, the ex-lover she lost and can never have back. Although she is a wolf, as a female she doesn't quite fit in with the pack, and she desperately longs to imprint on anyone just to heal her broken heart. Jacob, Seth and Leah continue to guard the Cullen home. Esme comes out to bring them sandwiches. Meanwhile, Bella's unborn baby grows exceptionally fast, and her body continues to grow more emaciated; her cheeks more sunken; her skin and hair ashen. One of her ribs is broken, and Carlisle warns her that the baby is robbing her body of the nutrition it needs; starving her by the minute. He warns that the fetus is incompatible with her body and her heart will give out before she can deliver. Bella and Edward are pitted against each other; Bella is ready to die for her unborn baby and feels that Edward will have a son or daughter through which Bella's memory would live on. But Edward cannot accept the baby if Bella dies, and he didn't choose for her to leave him. Bella's body becomes gaunt and frail; she is barely able to stand, and cannot walk unaided. Carlisle hooks her up to an IV drip. Jacob attempts to warm her up with his body heat. Bella suddenly leans forward due to nausea, but she is unable to throw up since she hasn't eaten in quite some time. Reading a thought Jacob has, Edward realizes that Jacob might have the right idea: the baby is thirsting for blood. Carlisle has some O negative human blood from the hospital's blood bank stored away. Bella drinks some and starts to feel better; her pulse immediately improving. Edward is bringing Bella another cup of blood and interrupts Bella's conversation with Charlie. Bella tells Charlie that she is better but she's going to a medical center in Switzerland. This upsets Charlie very much as he hasn't seen Bella since the wedding. Bella hangs up and becomes upset. Edward apologizes to her as he didn't realize how difficult this was for Bella. He realizes he's left her alone through this. Suddenly, he hears a voice he doesn't recognize. He realizes it's coming from the baby. Putting a hand on Bella's stomach, he realizes he can hear the baby's thoughts. The baby's heart is pure and good, like Bella's, and it loves both of them. Edward now wants to see the baby safely born as well. The baby is close to delivery, and Carlisle needs to be at his strongest. He and Esme must hunt. Emmett will go with them, but Sam still won't hesitate to go after them so that Bella will have fewer protectors. When Esme firmly tells Jacob that she and Carlisle are ready to lay down their lives for Bella, Jacob understands that the Cullens are a family as close-knit as his own. He knows what he must do. Jacob goes out into the woods and calls for a truce to speak with the pack. Paul (Alex Meraz), Embry (Kiowa Gordon), Quil (Tyson Houseman) and Jared (Bronson Pelletier) confront him. Jacob tells them that he wants Sam to take Leah and Seth back, and that when the baby is born, Jacob will personally destroy it-- he alone has the trust of the Cullens and the opening to do so. Carlisle, Esme, and Emmett rush out into the woods, pursued by Sam and another pack member. The two wolves take Esme down and are about to kill her when Emmett grabs her up and gets her to safety across a river gorge. Sam's howl alerts Paul that Jacob's truce was a ruse to split the pack up so that the Cullens could escape from them. Back in the Cullen home, Rosalie gets Bella to tell Jacob and Edward the names she's picked for the baby. If the baby is male, Bella will name him EJ, for Edward Jacob. If the baby is a girl, she'll be named Renesmee; after both Rene and Esme. As Rosalie hands Bella a cup of blood for her to drink, the cup drops and Bella instinctively tries to bend over to catch it. Her back suddenly breaks; she falls to her knees and one knee breaks. She's gone into labor. The placenta has detached and the baby will die unless taken out of her body immediately. Rosalie has to cut an incision in Bella's body for an emergency C-section before a morphine shot given as an anesthetic can take effect. But as she makes the incision, Rosalie is overwhelmed with blood-thirst and Jacob and Alice must pull her out of the room. Bella cannot be changed until the baby comes out, but it appears the baby will destroy Bella from the inside out before it happens. Desperate, Edward uses his teeth to finish the incision and extracts the baby. The baby is a girl. He shows her to Bella and calls her Renesmee. Bella smiles at her baby daughter as Edward puts Renesmee gently on her chest. The weight of the baby crushes Bella's fragile chest and suddenly her face and eyes go vacant. Both Jacob and Edward think she's dead. Edward passes Renesmee to a recovered Rosalie and works feverishly with Jacob to try and revive Bella. He takes a syringe filled with his venom and injects it straight into Bella's heart. But all their efforts are seemingly unsuccessful. Jacob tells Edward that instead of killing him, Jacob will let him live with his guilt. He then goes outside, sits on the ground and begins to cry. Seth realizes Bella didn't make it. From the edge of the woods, Paul, in wolf form, is watching. Edward continues to struggle to revive Bella, biting her several times to inject more venom, refusing to believe that she is truly dead. Back on the Quileute lands, Sam is telling Billy that even if Jacob is his son, he's betrayed the pack. Paul comes up and whispers something to Sam. Sam tells everyone that Bella is dead, and the baby killed her. He gives a curt order for the pack to follow; they're going to war. At that moment Jacob has decided that he will take revenge of his own for the loss of Bella. He stalks back into the house to kill Renesmee. Rosalie, absorbed in cuddling and playing with the baby, does not notice as he creeps up behind her. But Rosalie happens to lift Renesmee up to where the baby can look over Rosalie's shoulder. Baby Renesmee's eyes meet Jacob's and he freezes. Jacob imprints on Renesmee, seeing her future as a beautiful and gentle girl. Her future becomes his; he is now bound to become anything she might need; a brother, a friend, a protector. Sam and the pack arrive at the Cullen home. Rosalie is caring for Renesmee so only Edward, Alice and Jasper can defend the house, and now Sam has the numbers advantage, seven to three since Emmett, Carlisle, and Esme have not yet returned. Sam personally rushes to strike down Edward. Sam is ready to finish Edward when Carlisle, Esme and Emmett, revitalized, arrive back at the house to defend their family. Leah rushes out and saves Alice, and Seth follows behind her. The numbers are now just shy of even, but Sam and the pack are fighting to kill, while the Cullens, and Leah and Seth, are merely trying to ward the pack off. The standoff is ended when Jacob comes out to tell Sam that if he kills Renesmee, he also kills Jacob. Jacob phases into wolf form, advancing and snarling, and all of the wolves back away -- even Sam. Reading Jacob's thoughts, Edward tells the pack and the Cullens that Jacob imprinted on Renesmee which means that the pack cannot harm her-- it's their most absolute law. The wolves back off and leave, respecting Jacob's new mate. The Cullens clean and dress Bella's body, and Carlisle points out to Edward that Bella's heart is still beating, but she is immobile because of the morphine having took effect while she was in labor. All they can do is wait. Finally the venom kicks in; the bite marks disappear from Bella's flesh, her bones mend together, her cheeks and limbs fill out as her body regains its healthy appearance. Bella's heart stops beating and her skin turns pale. During the healing process, memories of Bella's childhood to adulthood are shown with the last memory being a happy Charlie and Renee holding a smiling Bella in front of a mirror. The camera pans in to show Bella's eyes as they suddenly open to reveal a crimson red color. Bella is now a newborn vampire. 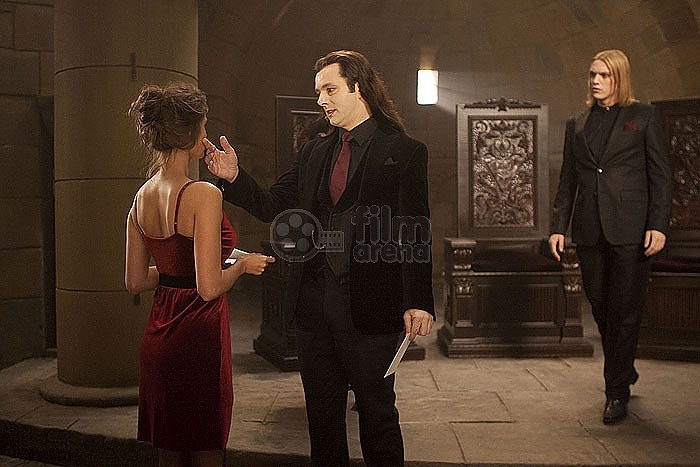 Partway through the credits is a final scene where the Volturi receptionist, Bianca, is delivering a formal announcement to Aro. Aro reads the announcement, which informs them that Bella has been changed and is Edward's wife. 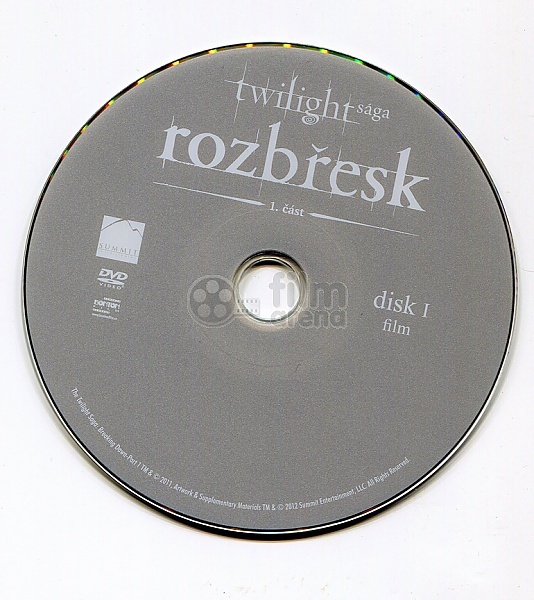 Marcus and Caius believe that the dispute with the Cullens is now over, but Aro scoffs at this; the dispute goes far beyond a single human. The Cullens have something that Aro wants.